Maintaining your new Toyota is just as important as getting it in the first place, and the expert technicians at our Toyota service center are trained and certified to make sure that your vehicle runs like new for as long as you own it. From routine maintenance, such as oil change service and tire rotations, to the more complicated car repairs, we can help you with it all. We even have a collision center for complex car repair in the unfortunate event of an accident. We’re ready to help you with all of your automotive needs. To take advantage of our stellar service department, call us at (813) 402-1342 or visit us 1101 E Fletcher Ave. Tampa Bay, FL 33612. Toyota of Tampa Bay is not only your home for all of the hottest Toyota vehicles, but it’s also home to the service department that’ll keep you in that vehicle for a long time. Visit us today. It’s easy for vehicle service to be a massive inconvenience, so at our Toyota service center, your convenience is our priority. While oil change service and other smaller services can lead to pretty quick trips to and from our service center, some services take a little longer. For your convenience, we offer loaner car rentals, an overnight drop box and a courtesy shuttle. Never feel stuck or trapped with your plans because of vehicle maintenance again. To add to your convenience, we make waiting for your vehicle a full experience instead of a boring and dull drag. To accomplish this, our state-of-the-art center offers cozy amenities such as a movie theater, complimentary popcorn, complimentary high-speed Wi-Fi, a kid’s playroom and more. With all of these amenities waiting for you, waiting for your oil change service doesn’t sound too daunting. Changing your oil routinely will increase the performance of your vehicle significantly. Talk to our service professionals to see whether synthetic motor oil or standard oil is best for your vehicle so that you can make the educated and right decision. We’ll even change your oil filter for you. No matter what you need, with everything else that our service department offers, getting an oil change or any other type of routine service is a breeze. Drivers in Brandon and Wesley Chapel, FL are more than welcome to visit our Toyota service center today to take full advantage of everything our service department has to offer. Stop by Toyota of Tampa Bay for a full shopping experience today. Take advantage of more than just vehicle maintenance and service when you visit our facility. We also have an extensive parts department that can help you get your hands on genuine OEM Toyota parts. If you’re looking for a specific component or accessory, we can get it to you right away. For example, we have a full inventory of tires for sale available to you. If you need a part that isn’t immediately ready in our store, we’ll order it for you so you can receive it as quickly as possible. If you’re ever in need of a body shop for collision repair, our Toyota Certified Collision Center is staffed with the best of the best to get your vehicle looking and working right. Auto body repair can get complicated for some, but our experts take care of complex repairs quickly and efficiently without breaking a sweat. Alright, maybe 1 or 2 sweats, but it’s easy nonetheless. See everything that our Toyota service center has to offer at our full-service facility. 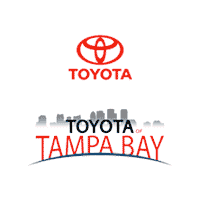 If you’re a driver in Tampa, FL, visit Toyota of Tampa Bay today. Convenience and service go hand-in-hand at Toyota of Tampa Bay. From all of the amenities in our service center to the services we offer for drivers who need to keep their life on the go, we make sure that keeping your vehicle in tip-top shape is as easy as possible. If you’re a driver in Wesley Chapel, Brandon or Tampa, FL, there’s no better choice than Toyota of Tampa Bay. From regular maintenance to bigger repairs to auto body collision repair, you can find it all at our Toyota service center in Tampa. Visit Toyota of Tampa Bay to experience true convenience today.